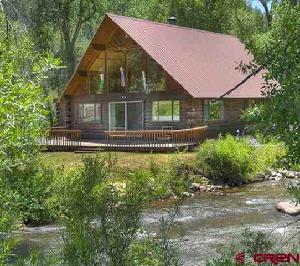 Florida Riverfront log cabin in beautiful subdivision within 7 miles of Durango. Fishing rights in 3/4 mile of the stocked Florida River and pond. This 2080 SF, 3BR-2BA, & Fam. Rm. log home and 2-car garage with a workshop sits on a .79 acre lot. Your Family will enjoy fishing, swimming, hiking, biking, mt. climbing and much more in this unique subdivision Easy access on county-maintained roads. You will enjoy the cool mornings on the riverfront deck and warm evenings in front of the brick fireplace in the living room or wood stove in the family room. Great home for family gatherings!!! There is a refrigerated air unit in the family room just in case it is needed. Copyright © 2005 Norma Engman Realty All rights reserved.